For many people when they think about home staging, they envision bringing in lots of new stuff. They picture movers with sofas, rugs, artwork, and more. Sometimes, what’s really needed is simply moving stuff around and repurposing it. Even a mix match of styles and pieces can end up in a good looking space when the right home staging professional is involved. Use what you have home staging. Occupied enhancements. Typically use what you have home staging is for occupied homes. Occasionally it happens in homes where sellers have left their furnishings and moved on to another residence, or perhaps the home is really a secondary or vacation property. In any case, we typically treat projects like this as occupied enhancements. Understanding how the room should function and feel to potential home buyers can make a big difference in creating the right dynamic, even with what is already in the home. Doing what’s not been done to create great results to sell your home. Thinking outside of the box is one of be best benefits of hiring a professional home stager. We have the ability to do what’s not been thought of previously as we are able to look at the home with fresh eyes and without any constraints as to how things have always been. In the photo above, these art pieces had been scattered throughout the home, each of them having minimal impact in their space. When put in the hands of St Augustine Home Stager, Melissa Marro, they became a strong focal point, which anchored the space and distracted from the big screen TV in the room. When the listing agent, who hired Marro came through the house she actually thought the TV had been removed from the room as she no longer noticed it. 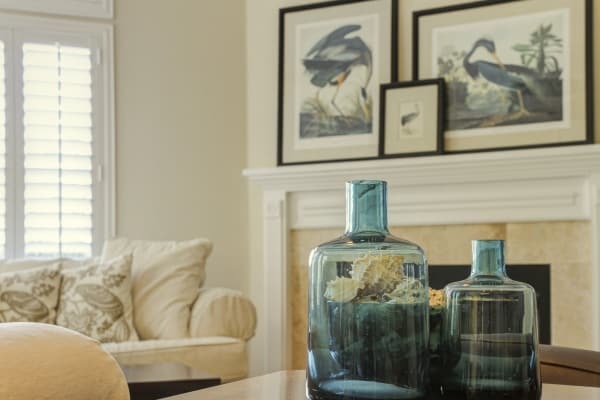 Good home staging allows the furnishings to help direct the buyer’s eye through the home, vs furniture, art, and accessories just being “in the home”. By helping direct the buyer’s eye through the home, they will notice more of the home’s features and benefits VS the seller’s belongings. This is one of the key’s to making a quick sale.